FORMER Fremantle midfielder Michael Barlow has a new home. Barlow, who played 126 games with the Dockers, will land at the Gold Coast as a delisted free agent. In a statement from the Suns, Barlow said he was excited to extend his career with another club. “There’s a real excitement around the group speaking to guys like David Swallow (and) Michael Rischitelli,” he said. “They can’t speak highly enough of where this club’s going and the dynamics of it internally. The 28-year-old played 13 games in 2016, averaging 25 disposals and a goal every other game. His best game came against Port Adelaide in round 13 when he gathered 43 disposals and kicked two goals. His last game for the Dockers was in a loss against Geelong in round 17. Barlow joins Pearce Hanley, Jarrod Witts and Jarryd Lyons who have joined the Suns following the 2016 season. 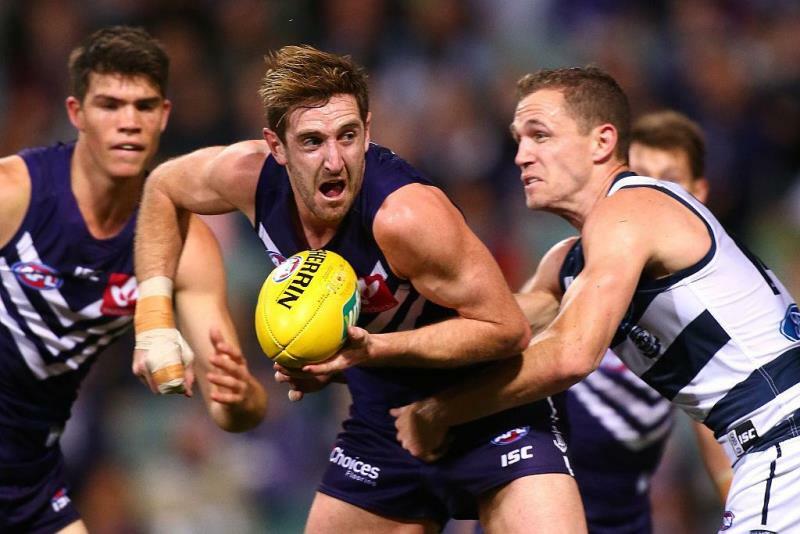 Meanwhile Fremantle ruckman Zac Clarke has agreed to a one-year contract extension. The 26-year-old was out of contract but the new deal ties him to the club until at least the end of the 2017 season. “Being overseas pushed (contract talks) back a bit longer, but I’ve been here for a while now so it’s really good to add another year,” he said. Clarke came to the club via the 2008 draft and has played 101 games for the club. He played 13 AFL games in 2016, collecting 249 hit-outs, and also featured in Peel Thunder’s maiden premiership.